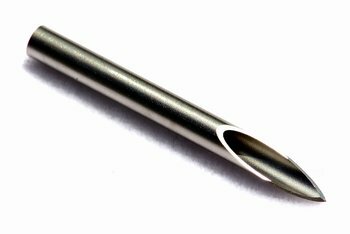 A polished, hollow stainless steel tube with a beveled, extremely sharp tip, created for the purpose of body piercing. Hypodermic needles with the hubs cut off were often used before piercing-specific needles started becoming widely available. Cannula needles with a plastic sheath are often used instead of the plain steel needles in Europe. Needle should only be used once, then disposed of in a sharps container. This page was last modified on 21 April 2006, at 08:51.